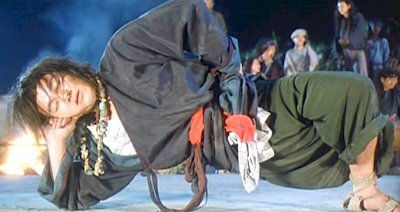 The Skinny: Entertaining costume picture that features a comparatively subdued Stephen Chow, as well as impressive production values and a well-developed, if not overly typical storyline. This isn't the best example of Chow's comedic charm, but it's a solid HK Cinema experience that's worth a look. Be sure to check out the "sleeping kung-fu". Gordon Chan directed this entertaining kung-fu comedy that features heavy production values in place of the customary Stephen Chow shenanigans. Chow is the legendary Beggar So, who starts off as a spoiled would-be scholar. He may be a fine martial artist but his lackadaisical, superior attitude and shameful illiteracy make him a prime target for various nefarious evil-doers. Thanks to their efforts, as well as his own spoiled laziness, So receives a fitting fall from grace. He and his father (Ng Man-Tat) are sentenced to be beggars, and So sinks into self-pity. Meanwhile, evil court magician Norman Tsui Siu-Keung plans a coup, and a resistance effort (led by Chow's usual leading lady Cheung Man) plots against him. They want So to be involved, but his pride won't allow it. It isn't until he learns the nifty "sleeping kung-fu" that he regains this self-confidence and can ascend to his rightful place as leader of the Beggar Clan. And there's comedy, too. For fans of Stephen Chow's usual mo lei tau, King of Beggars may seem puzzling. The brief asides for wacky comedy seem almost extraneous, as director Gordan Chan is much more concerned with the kung-fu clichés that typify these sorts of costume pictures. The film moves a bit slower than the usual Stephen Chow escapades, and actually begins to resemble a western film in its three-act storyline and tried-but-true plot devices. The result may seem almost obligatory, but the film still manages to be quite entertaining and enjoyable, though in a more mundane way than you would expect from Stephen Chow.